I've had some bush beans in the system for about 6 weeks now, and they don't seem very happy - pale leaves, not growing much and flowering. Is it too hot for beans over a Perth summer? I always thought beans were a winter plant, like peas. Thats what I use - It lists climbing beans for Dec, Jan and Feb, though not sure I believe it! The beans my better half planted in the wicking beds a month ago have grown up about 10 cm and then died. Yet all the guides say that beans should be planted now! I've clearly got no idea either. My beans grew good, flowered but no fruit. ??? Even though I have Rhizobia bacteria in my soil from previous bean and pea crops, I always inoculate seeds with a Bean-Pea Inoculant before planting green . The varieties can be heavy feeders... make sure the earthworms are active in that bed... maybe even supplement a bit with foliar spray of vermi-tea. I had crap luck with beans last Summer, they got all raggedy and died. Sprayed Neem oil on them because I though it was little white flies causing the problem but they didn't recover. I had decent luck with beans the year before but didn't have that many growing. 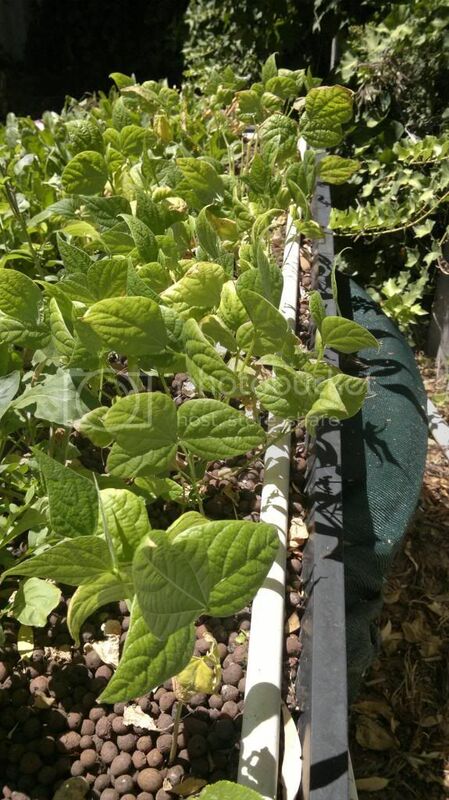 Previously I had a bean plant that was super pale when all the other plants were deep green, but I chalked that up to the plant being next to the water inlet and getting drowned. My goal in life is to find out what happened to my green bean plants last year! I'm mostly a lurker her but have been gardening for a looonnngg time and doing backyard aquaponics for a few years. Legumes fix nitrogen in the soil. In other words, they make nitrogen in the soil for other plants to use. It's why corn and squash grow most excellently around beans; ie, the three sisters gardens. Aquaponic beds always have plenty of nitrogen but usually run short of other nutrients. My solution was to bury a few banana peels in my grow beds at the beginning of the season (which is right now here in Texas). Once the peels decompose, you'll get a better balance and you'll notice more 'fruits' on your bean plants.